I've been looking forward to writing this post for such a long time! Today I’m going to introduce you to the Moomins! The Moomins were created by Tove Jansson, a Swedish speaking Finn. They live in Moomin Valley and have been very popular ever since they were created in 1945. I would like to introduce you to each of my favourite characters and tell you a little bit about them. Mumintrollet (Moomintroll) is the very adventurous main character. His best friend is Snusmumriken (Snufkin) and it is quite clear that he is in love with Snorkfröken (Snorkmaiden). Moomintroll loves to collect things and is fascinated by nature. 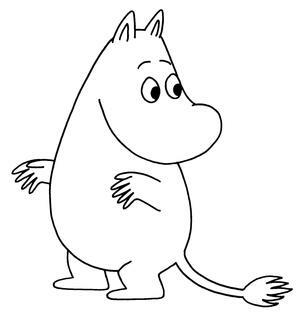 Curious and brave, Moomintroll is also very sensitive and enjoys being with his friends and family. Snorkfröken (Snorkmaiden) is very girly and dreamy and often flirts with Moomintroll. People find her irritating because she is fickle, but she is my favourite character of all. 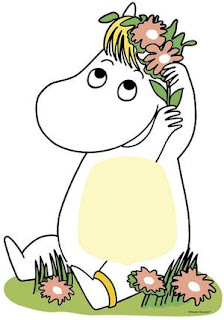 She is pretty and looks after herself and, being a slightly different species from the Moomins, changes colour according to her mood. Snusmumriken (Snufkin) is a very curious character, always out exploring and enjoying the journeys that he takes himself on. He has a warm heart and is loved by the other characters, however, it seems that he prefers to travel alone. He is usually seen fishing, playing the harmonica or walking around in the moonlight. Muminmamma (Moominmamma) is calm and sweet and very loving. 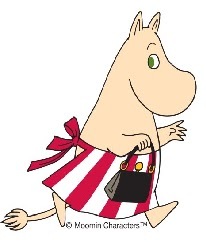 She runs the Moomin household and loves to make sure that everyone is happy. She doesn’t get angry if someone breaks or ruins something, she often looks for the bright side in everything. She likes to spend quiet moments by herself collecting shells and she carries a handbag with all kind of important and useful things inside. She is a peacemaker, finding solutions to the problems that the others might experience. Have you read any of the Moomin stories? Maybe you’ve seen the TV show? Who is your favourite character? I don't think I've ever watched them before but they do look familiar! Never seen them before. I sure am glad I don't change color with my moods! I like to keep people guessing! I haven't seen them before, either. They're so cute! This is all new to me, but I can see why they'd be so beloved. There is something vaguely familiar about them. Were they ever a toy in a Kinder Egg? I may have even seen an episode once upon a time. Instant flashback to "barnetimen". Great post. awwwwwwwwwwwh! im a sucker for cute things like this. never heard of them, wish i had earlier! trekking your blog!!! cute little ones! are they related with the trolls? there are some small toys with their hair upwards with big eyes? Moomin...how utterly delightful! So cute. Thanks for enlightening us as always. I haven't heard of them before either. Cute characters. I'm forwarding this to a friend who might be able to understand the words. Very sweet. Afraid this is the first time I've ever heard of the Moomins! New to me! But they do look adorable and like a fun bunch. Their appearance reminds me of a stuffed toy I had when I was little called a Zwibble Dibble. I loved Zdibble, as I called him, and outfitted him with clothes, toys, backpacks, etc. Those guys are cute! I'm a Scooby fan myself. Very cool cast of characters! Its fun toe create and develop them. And draw them too. And thanks for stopping by and saying hello! They look sweet! Love the cast of characters. Great post. I love Moomins! Delightful! Moomins--I must try to remember them. Hey there! It sure looks like A-Z is going well for you. Take care.